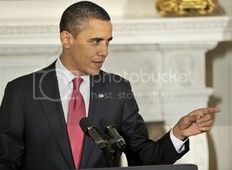 "Barack Obama", "Election 2012", "Frank Schaeffer", "leadership"
The "disappointed" left says president Obama sold out. The racist-laced Medicaid-mugging, billionaire-codling right staggers under the weight of terminal "birther" mythology (now trumpeted by moron-come-lately Donald Trump). Meanwhile president Obama continues to bide his time and looks down the road to the post-2012 reality when his patience with an impatient country, his thoughtfulness in the context of a sound-bite-entertain-ourselves-to-death era of short attention spans and historical amnesia will be vindicated. If you think that president Obama played the Republicans in the last lame duck congress like a violin just wait until after 2012 when the rotten Tea Party will be about as relevant as 1930s hate monger radio priest: Charles Coughlin (the "father" of hate radio), is today. President Obama has met the vile far right (and religious right lynch mob) and also met the disappointment of the shrill impatient left with a calm smile and good humor. He's even reached out to what remains of the Republican Party languishing hock deep in the quagmire of their own frightened and wholly imagined paranoid "victim" status. President Obama has also played chicken with each new crisis and -- invariably -- pulled last moment hair raising victory from what critics said would be defeat... Before he'd served a year president Obama lost the support of the easily distracted (bitter?) left of the Left and also became the target for the white hot rage of the hate-filled right of the Right. But some of us, from all walks of life and ideological backgrounds are sticking with our president. I am sticking with our President through thick and thin not because he is perfect in all he does but because he is indeed the closest thing to perfecting the will of the majority of Americans granted the limitation to get things done is unprecedentedly difficult in our current political environment. I can unequivocally say that I have yet to see any Presidential contender from the left or the right that has the kinds of collective leadership qualities President Obama holds: strong and decisive, who I can personally trust to make the hard decisions while I sleep comfortably at night, a man who understands what Americans are faced with and doing everything within his power to ensure they get the necessary help, someone who has surrounded himself with good advisers and cabinet appointees who can actually get things done and manage Government affairs effectively, etc. No one I have seen in our political radar is remotely capable of doing what this President had done or can do and yet there is so much contempt and hating on this President. I believe it is important even from the left to re-evaluate and assess how we are defining the progress made by this President and start giving our President some respect for the things he had done collectively to date because he deserves it. He has earned it. Instead of dressing him down in public for no good reason except to belittle his standing or stature, we ought to start protecting one of our own from lies, deceit and contemptuous rhetoric spewed by a small number of people without the slightest concern for the majority of Americans and their well being except for advancing their personal crusade. We must start saying enough and protect our own. It is indeed time for us to shape and guide our ideologies using our conscious mind and be grounded rather than use our subconscious mind that is reactionary and often misses the big picture of governing a great nation. I often believe harsh critics of this President who are hell bent in throwing the kitchen sink at him day in and day out has lost the battle within themselves where their subconscious mind has outsmarted and outdone their conscious intellect losing any credibility and legitimacy one might have left in them. Frank Schaeffer notes in the article that President Obama is not mistake free but who is? What is beyond comprehension for some is that the President is just human just like them who uses his conscious brainpower while intellectually light years ahead of most humans. President Obama wasn't able to walk on water! And he has made mistakes! But he has his feet firmly planted on the ground and understands the reality of what America has become and just where he must function, which is more than his critics can claim. President Obama also keeps proving that compared to the talking-heads he knows how to get things done that actually change lives and matter-- health care reform, gay rights (instead of mere slogans), actual education reform, ending a war, restoring America's image worldwide. We Americans are very lucky people. A sane and compassionate president is in charge. Over an 8 year period he will change American history for the better. Only president Obama's dimwitted and/or hate-filled opponents are unlucky: they are betting against a political genius who also happens to be a very good human being. The proof is in the pudding as they say. In two and half years, our President has prevailed in advancing many changes and will continue to lead this country in the right direction. Given the opportunity, I have no doubt he will continue to lead this country effectively and every day the American People are witnessing what most of us had known long ago, his unconditional commitment to serving the people. For more specific evidence or detail accomplishment of this President, I invite you to read my diary titled "I Am The Kind Of Democrat Who Is ALL IN For President Obama" which we all must be reminded of often to ensure that our conscious mind is charged with facts and not played on by media personality and professional Obama-haters who describe president Obama in the most contemptuous, disrespectful and disingenuous ways. The most surprising element however is how once the most powerful position has become the most ridiculed position on the planet by the PL, frustrati, and the Right totally unprecedented of past historical comparison especially when one performs by far in the most effective ways as this President has. I guess being Barack Obama disqualifies the respect the most powerful position, the President of the United States, is afforded. Well, I don't know about you but I can say this a million times over though..."We Americans are [indeed] very lucky people. A sane and compassionate president is in charge" and the respect I have for the man is uncompromisable. I hope you feel the same way as I do and are getting ready to double up your efforts to re-electing this gracious and grounded man, Barack Obama. Jul 18 "Why We Need President Obama -- A Critical Moment"